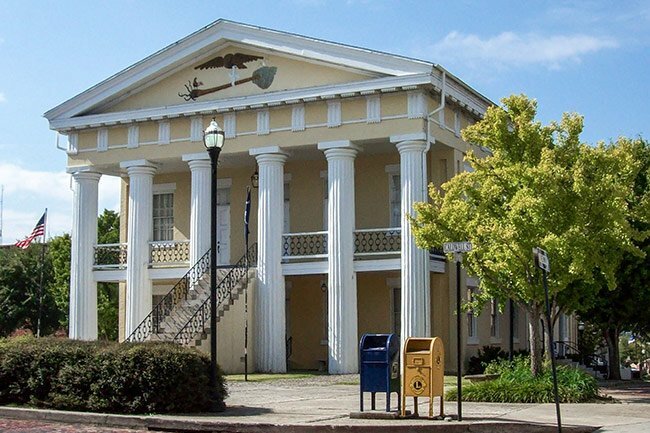 The architecture of the Old Newberry County Courthouse in the county seat of Newberry tells the story of antebellum South Carolina, the Civil War, and Reconstruction. 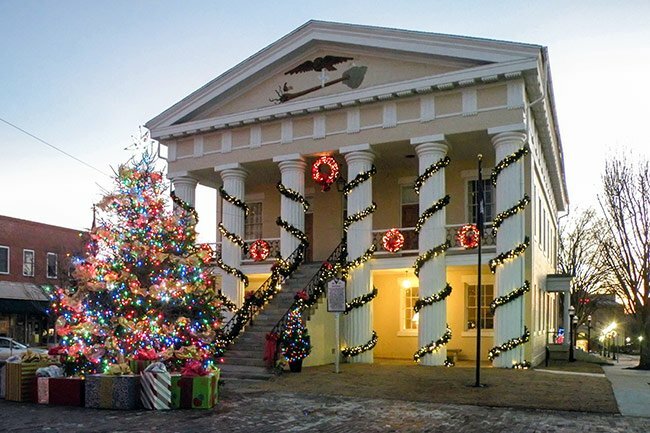 Built in 1852 during Newberry’s period of cotton-bred wealth, the Greek Revival structure was a testament to the success of the town’s merchants and planters. By the war’s end in 1865, the state was scorched and struggling to rebuild its prosperity, an impossible task without the free labor of slaves. In 1876 architect Osborn Wells was hired to remodel the courthouse. To exhibit hope and strength in an economically-devastated South Carolina, he added two porticoes, each with three prominent columns, and designed a bas-relief that depicted the spirit of the state at the time. Seen in the bas-relief is an eagle – symbolizing our nation – carrying an uprooted palmetto tree, representing the state. On the tree’s roots sits a fighting gamecock, said to be “crowing defiantly.” At the tree’s crown is a dove holding an olive branch. The Old Court House, erected 1852, was designed by Jacob Graves and built by James Damron. 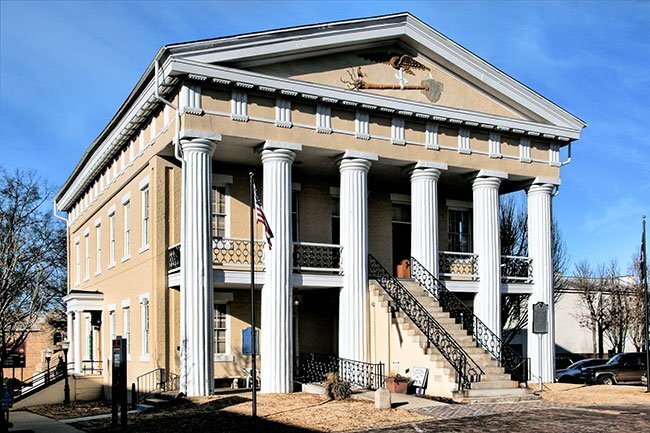 An outstanding example of Greek Revival architecture in stuccoed brick, the building has six fluted, Tuscan columns which support a massive, triangular pediment. The intricate Doric entablature includes a frieze design of alternating triglyphs and undecorated metopes and regulas of architrave and mutules of cornice decorated with guttae. The building’s elaborate detail and massive proportions attest to the affluence of pre-Civil War Newberry County. During Reconstruction, Osborne Wells was assigned the task of remodeling the courthouse. Wells’ additions included two-column porticos at side entrances and a bas-relief mounted on the frontal pediment. This bas-relief depicts the spirit of the prostrate state: a U.S. eagle holds an uprooted palmetto tree in its talons; perched upon the tree roots is a gamecock crowing defiantly; at the top of the tree a dove bears an olive branch. This building, the fourth in a series of five County Courthouses, was used for court sessions between 1852 and 1906.